Bonnie Prince Charlie is known to history as one of the most romantic rebels ever to launch a claim for the crown. As the son of the exiled Old Pretender, James III, and the grandson of James II, Charles’s claim to the throne was based on his direct descent from the Stuarts, as opposed to the convoluted descent of the German Hanoverians who occupied the throne after the death of Queen Anne. However, Charles’ chances of ever regaining the kingdoms of Scotland and England for the Stuarts looked impossibly slim when, in 1745, he decided, with only a handful of supporters, to lead a revolt in Scotland. Despite little money and few arms, he rapidly succeeded in raising the Highlanders to his standard and was soon in Edinburgh where his father was proclaimed king. In London, there was general panic and when news was received that Charles’ army had reached as far south as Derby, many assumed that the Hanoverian’s days were numbered. The Scots army that Charles led was, however, poorly supplied and ill-disciplined and was chased back into Scotland by the Duke of Cumberland known after Charles’ final defeat at the Battle of Culloden in 1746 as ‘Butcher’ Cumberland. 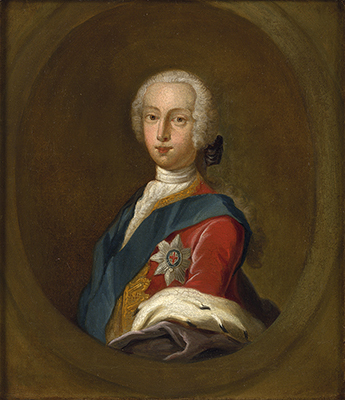 This picture shows Charles at the time of the rebellion of 1745. The likely artist, the engraver Robert Strange, accompanied Charles during the invasion and even designed banknotes for the envisaged Jacobite regime. Although not known as a large-scale oil painter, Strange did paint a number of miniatures of Charles in oil, and it is possible that this small canvas is a larger interpretation of his well-known 1745 engraving after a portrait by Allan Ramsay [Earl of Wemyss].